Intangible Cultural Heritage (ICH) is promoted by UNESCO as a counterpart of the World Heritage which focuses mainly on the aspects of culture. Intangible Culture includes songs, music, drama, skills, cuisine, annual festivals, crafts and the other parts of culture that can be recorded but cannot be touched. National Library and Documentation Services Board is the focal point of the project known as Safeguarding of the Intangible Cultural Heritage. 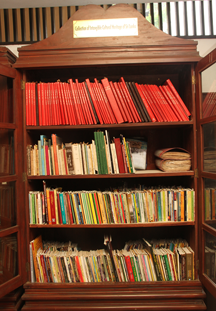 Building up of a collection on Intangible Cultural Heritage is one of the tasks undertaken by the National Library. This collection include a large number of books on the subject. It also includes a large collection of manuscripts on Sinhalese folklore, folk songs, folk tales, Sinhalese legends, Sinhalese customs and ceremonies, rituals, deities, demons, etc.